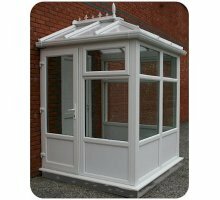 All of our Edwardian style porches are supplied made to measure at no extra charge. Standard roofs are manufactured from strong clear multi wall polycarbonate roof sheets but you can also select bronze or opal polycarbonate roof sheets. You can also choose to upgrade your roof to a glass roof. Roof glass is available in standard roof glass or low energy self cleaning glass in clear or blue tinted. Prices shown do not include opening windows but you can upgrade to up to 4 opening windows. You can also add a letter box. Door and window furniture is supplied in white as standard. External frame projection size = internal size plus 70mm x width external frame size = internal size plus 140mm Price excludes any opening windows . Sizes given are external brick work sizes. Edwardian porches are made to measure if you require a size smaller please enter the external brick work size width x projection. 2.5m wide x 2.0m Edwardian Porch With full height, half glazed panels. Low-e toughened, argon filled double glazed units. Front frame height up to eaves beam 2100mm. Ridge height needs approx 2.750mm from DPC. Opening top windows: Select the quantity you require. Frame Colour: Choose from White, Light Oak or Rosewood. Letter Box: Select if required. Door Furniture Colour: Select from White, Chrome or Gold. Door Positioning & Opening: Select the location of the door and whether it opens in or out. Cylinder 3 Star; The 3 Star locking cylinder is our most secure locking system we offer. Delivery Service - If you do not have personnel available for unloading the lorry. Please select 2 man delivery in the options. This is a surcharge in addition to the normal delivery charge. 1.5m wide x 1.5m Edwardian Porch With full height, half glazed panels. Delivery Service - If you do not have personnel available for unloading the lorry. Please select 2 man delivery in the options. 2.0m wide x 820mm projection Lean To Porch. With full height, half glazed panels. As standard you will receive a variable pitch roof to support polycarbonate or glass. Front frame height up to eaves beam 2100mm. Frame height up to wall plate 2400mm This excludes the roof. Premium grade, one part, neutral curing, silicone sealant for glazing, constructions and industrial applications. Perimeter sealing of wood, PVCu and aluminium widnow and door frames. Sealing of roofline and drainage systems. Weathersealing of aluminium glazing systems, curtain walling and facade panels. Can be used in direct contact with all types of glass, except self-cleaning types (use SOUDAL SMX 506 for this application). Bedding of double glazed sealed units in wet glazing applications*. Sealing of expansion and movement joints in construction. roofing seals including lead roofing slates, and fibre-cement. Industrial sealing applications; coated metals, anodized aluminium, stainless steel. HVAC ducting, pipework, and drainage joints. general maintenance and sealing of cars, caravans, mobile homes and boats. *Due to the number of sealed unit sealants available, a prior compatibility test is recommended. Fast curing neutral silicone (very low dirt pick up). Solvent free silicone, no shrinkage during curing. Virtually odourless. Thick-bodied formulation for ease of use. Excellent break off and tooling, Excellent primerless adhesion on all common construction materials, (glass, plastics, masonry substrates, metals and wood). For natural stone applications we recommend the use of SILIRUB MA. Resistant to UV, rain, snow and ozone, and many chemicals. Low modulus of elasticity, high movement capability. Independently tested to ISO 11600 F&G 25 LM standard (test reports - IFT Rosenheim 504 35398/1, 504 35398/2. High and low temperature resistance (from -40ºC up to 200ºC). Surfaces to be sealed must be dry, clean and free of dust, grease and other contaminants. Apply at temperatures between +5ºC and +40ºC. for more detailed information consult the technical data sheet. 18 months from manufacturing date, see above for expiry date. ISO 11600 F&G LM - Primerless on glass, aluminium and concrete. Clear, Brilliant White, Teak, Brown, Black, Caramel, Bronze, Toffee, Grey, Dark Grey, Alu-Grey, Anthracite Grey RAL 7016, Buff, Portland, Beige, Stone, Oak, Light Brown, Dark Brown, Rustic, Red/Terracotta, Basalt Grey RAL 7012. For an extensive range of RAL colours. Description : 450 Builders Silicone is a premium quality low modulus non-corrosive neutral cure silicone sealant that adheres to virtually all substrates, both porous and non-porous. Typically used for construction expansion joints and perimeter pointing of all types of door and window frames. Conforms to ISO 11600 class: F 25LM. • Excellent flexibility - +/- 25%. • High resistance to plasticiser migration - may be used over water based and solvent based paints. • Excellent external weathering properties. • Perimeter pointing internally and externally around PVCu /wood and all other window frames. • Sealing and as an adhesive onto PVCu, plastic trims and components. • Bedding insulated glass units in accordance with relevant clauses of BS8000 Part 7. • General glazing sealing and draughtproofing, including repair work over existing sealant. • Glass to glass and glass to aluminium sealing. • Do not use in conjunction with bitumen asphalt, neoprene and certain organic elastomers. • Do not use on substrates that bleed oil, solvents or plasticisers. • Non overpaintable. Use WEATHER MATE. • Use as a mirror adhesive; Not recommended- Use MIRROR MATE. 450 Builders Silicone is a premium quality low modulus non-corrosive neutral cure silicone sealant that adheres to virtually all substrates, both porous and non-porous. Silicone 700T is a fast, neutral cure, low modulus sealant specially formulated for the PVCu and roofline industry. For perimeter pointing window and door frames, sealing plastic roofline areas and general weathersealing. Now contains a powerful anti-fungal compound. Our uPVC fascias and soffits from are designed as a cost effective and maintenance free solution for replacing existing old timber fascia boards. They are available in a wide range of colours and styles. Or for new installations. The fascia boards are thick enough to nail directly into the rafters of the roofs for quick and easy installations. Our range of BSI approved rooflines is is fully guaranteed and available for home delivery. 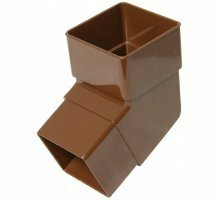 Description : Floplast Gloss Brown Square 65 mm Downpipe stand off clip, for use with Floplast 65mm Square Downpipe. Description : Floplast 112 degree Adjustable offset downpipe bend for use with Floplast 65mm square downpipes. This two piece offset bend can be cut to size, marked in increments of 5mm, from 25m to 65mm. Allowing for variable distances between the running outlet and the downpipe against the wall. 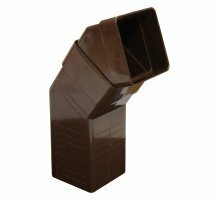 Description : Floplast 112º offset downpipe bend for use with Floplast 65mm square downpipes. 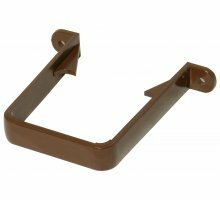 Normally bought in pairs and used to bring the downpipe from the running outlet in towards a wall and then back to a vertical postion. 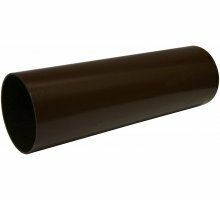 Description : Floplast 68mm Gloss Brown 4m Downpipe, fits straight into fittings. We ship across the UK. Direct to your door. You can pay easily and securely with your PayPal account or with your Debit or Credit card. Call us, we have experts waiting to help you.